CONDITIONS OF SALE: This painting has to be exhibited publicly between 21 February and 19 May every year. A deposit of $100 is required before the transfer of ownership, with the rest of money due in 100 years, and paid to the AbFab charity fund. STORY: One of the most prominent weaknesses of the American society is its racial intolerance. Ever since the foundation of the Nation of Islam in 1930, more and more African Americans have been converting to Islam (or actually going back to their original religion before slavery). This became a real issue after the USA contributed towards creation, and subsequently pledged to maintain the security of the Jewish state in Palestine, in the middle of the Islamic world. American governments have been doing almost everything to reverse this trend, from jailing or killing spiritual leaders of the Nation of Islam to starting a "War on Terror", but the issue remains a major force that is dividing the fabric of the American society. 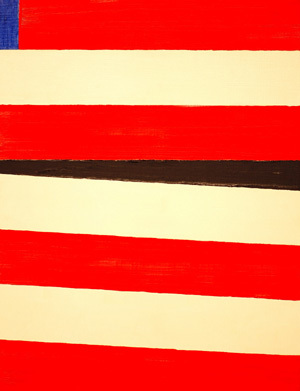 In this painting red and blue stripes of the American flag are separated by a wedge of black colour, latter symbolizing the black population. The American flag is easily recognizable in the popular culture even from its fragments, because of its omnipresence in Hollywood movies. Asking price for this painting is an homage to the Million Man March in Washington DC in October 1995. The painting does not contain representations or visual depictions of objects, and is thus perfectly suitable for exhibition in a mosque.